Power Search lets registered site members sort site listings with more advanced criteria. It is allowed to specify accommodation type, conveniences included, furniture, surroundings, number of rooms, and lease period. Owner or searcher characteristics can be submitted here also. Listings can be sorted by ones age, gender, smoking habits, cleanliness, overnight guests, pets, children, and some other criteria. Submitted search criteria can be saved for future use. Once search criteria is specified member can give it a unique name and save using form below. 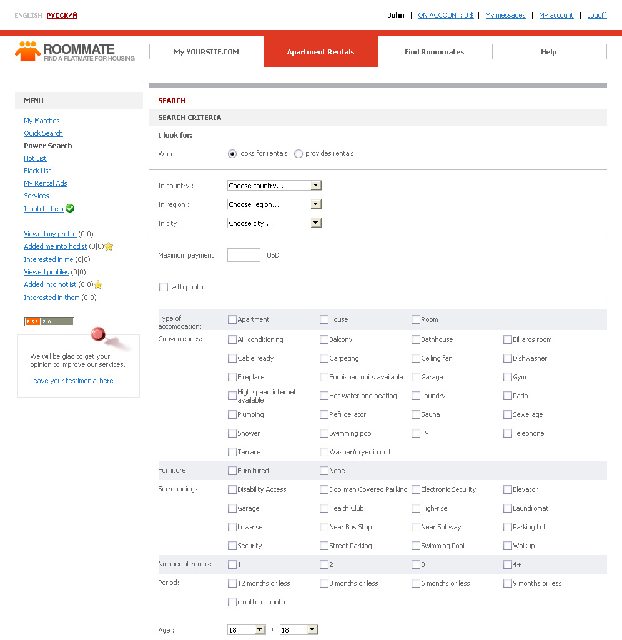 Once the form was saved it can be uploaded again for further use or even removed. “Upload search criteria” area allows choosing certain search criteria from the list and using selected criteria by using “upload” tab or removing it with “Delete” button.